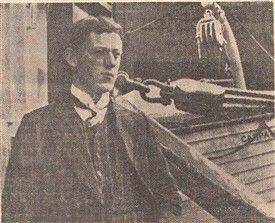 Harold Cottam of Southwell photographed on the boat deck of the Carpathia in March 1912 at the start of his most eventful voyage. The ship's name can just be discerned on the lifeboat, right. The luxury liner RMS Titanic is sinking after hitting an iceberg at 23.40hrs on April 14th. April 2012 sees the 100th anniversary of the sinking of the RMS Titanic – the ‘unsinkable’ ship famously holed by an iceberg on its maiden voyage. As the great ship settled in the water in the early hours of 15th April, fifty-eight miles away, 20 year old Harold Thomas Cottam of Church Street , Southwell (later of West Bridgford) in Nottinghamshire was a wireless operator on RMS Carpathia. Through Morse Code messages received on his wireless set, Cottam became the first person to respond to the unfolding tragedy of the Titanic. The Titanic’s impassioned pleas for assistance in Morse Code are recorded and reproduced verbatim on websites and in a number of museums, including as part of a permanent exhibition at the National Maritime Museum at Greenwich – and Cottam’s responses are faithfully reproduced alongside. Cottam 12.25am :SHALL I TELL MY CAPTAIN? DO YOU REQUIRE ASSISTANCE? After steaming at 17.5 knots for just under four hours, the Carpathia reached the Titanic at 4.10am . By 8.30am she had picked up the last lifeboat with survivors and left the area at 8.50, bound for New York . Over 1500 people died in the Titanic disaster, but over 700 more were saved – due in no small measure to the vigilance of 20 year-old Harold Cottam of Southwell. Cottam received a ‘hero’s welcome’ when the Carpathia reached New York . He continued to work at sea until 1922 when he took a job as a sales representative. 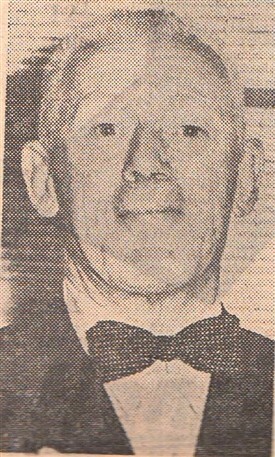 He died at Lowdham in Nottinghamshire in May 1984, aged 93. This page was added by Website Administrator on 13/04/2012.